I had the pleasure of virtually meeting Alenka several years back, when she was paired with me for Lori Anderson's Bead Soup Blog Party. She's an extremely talented polymer clay artist and beader from Slovenia. A few weeks ago, Alenka had a great idea to launch us into spring, and to celebrate her birthday, by hosting a Butterflies Birthday Blog Hop. The rules were quite simple, create something in the theme of butterflies and post on the reveal day. Having measured over eight feet of snow in New England, I knew I had to jump on in and join this hop to get that springy feeling!! Plus, who doesn't love butterflies!? And of course I wanted to help celebrate my friend Alenka's birthday! So HAPPY BIRTHDAY ALENKA! I'm glad to call you my friend. In keeping with my other challenge this month, Blogging from A-Z, "J" is for juxtaposition. Because isn't it funny and out of place to see a butterfly with snow in the background!? Thank you for hosting this fun challenge Alenka! 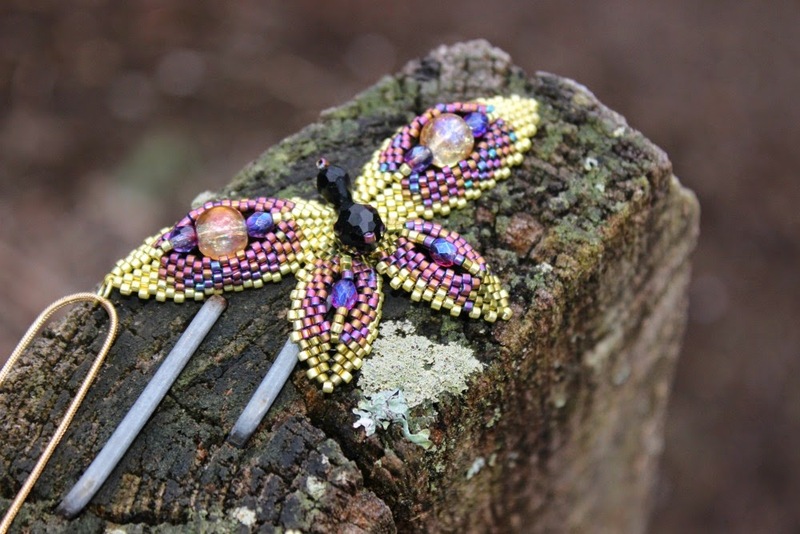 Please check out the others butterfly creations by visiting these blogs! Looking for more A-Z blogs? Click here! Oh-My-I-Love-This-So!!! Your colors, the design, the beads in the center of each wing, the little body, your colors (i know i said that already, but your colors!) ~ if all that butterfly goodness doesn't chase the rest of the snow away then nothing will! Oh wow I love your butterfly so beautiful! I am with Christine the colors are spectacular! You are right juxtaposition is a great word for the picture of a butterfly and snow. Oh, my, this is SOOO pretty, Amy! Awesome photo with the snow in the background, too. I completely sympathize... here north of you in Maritime Canada we are still getting more snow this past week!! Love your butterfly, Amy. I think it is chasing the snow away. That would be so pretty as a hair ornament too. Just love your design! I think butterflies really lend themselves to creative design. 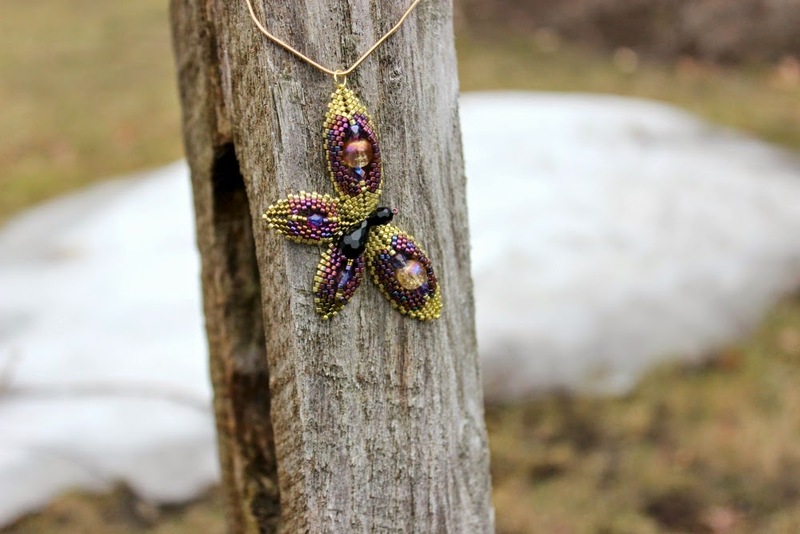 Lovely colors, and the buterfly blog hop is just right for the beginning of spring. Hope your snow is almost gone! Stunning butterfly, I live in the same boat way too snow...so butterflies were the best idea, yes spring is now upon us. Your butterfly pendant is just gorgeous my friend! I absolutely love your butterfly pendant!! Amy, the butterfly that you've designed is gorgeous! It's a great design and the colours were beautifullly chosen. I love it! WOW! Your butterfly is gorgeous. Butterfly in snow. its an amusing concept. Snow in April, aren't we sick of it. Tropical colours in the snow... The colours will start melting it right away!!! Love your work very much, it's really very pretty! Wow, what a beautiful butterfly, I love everything about it.!! Your beautiful butterfly has left me gob-smacked! A phrase I picked up in England which perfectly describes mt reaction. My chin hit the floor! Everything about it is perfect .